Running an Adwords ‘Search Query Report’ will provide you with all the keywords that result in PPC clicks. Use this list to highlight high volume / high converting keywords currently not considered as part of your SEO strategy. On the flip-side use your analytics software to analyse your natural keyword clicks can help expand your PPC keyword list – the ‘long tail’ often provides some surprising clicks and conversions! Which PPC ad creative provides the best click through rate? Utilising the best performing PPC ‘message’ in your web page’s title and meta description can help natural click through rate too. If you’re launching a new product or area of your website and are unsure of the keywords to target as part of your SEO strategy, use PPC to test. Due to its on/off nature a short PPC campaign can very quickly provide you with valuable search volume, CTR and conversion data at keyword level. While PPC campaigns tend to target a specific cost per sale (CPS), SEO sales are often considered ‘free’ (which of course they’re not). Looking at a blended CPS across both PPC and SEO allows search marketers to subsidise strategic ad placements through SEO to allow incremental sales growth. This allows advertisers to deliver more sales at the right cost but means that brand visibility is increased. When you achieve that all important #1 position in the organic results, which PPC position will provide the most combined volume? Test different ad positions for that keyword until you find the combination that provides the most traffic / conversions at the cheapest price. Are you appearing on Google’s content network as part of your PPC strategy? If you are, extrapolating a list of sites your ads are appearing on may present some high quality link building opportunities for your SEO campaign. Remember due to the inner workings of the content network, the fact that these sites display your ads already means Google thinks the site is relevant to yours. Anyone who has either changed domains or had a major site re-structure will be more than aware that it doesn’t always go to plan. Organic rankings may be lost for a matter of weeks or even months until all changes are picked up by the search engines. Running a PPC campaign targeting those yet-to-be restored rankings is an effective way to ensure no traffic or business is lost. If you are launching a viral or link-bait project as part of your SEO campaign, use a short term PPC campaign to attract attention. The more people that see it, the more widespread the ‘virus’ will be resulting in more natural links! Keyword density – the frequency of the keyword(s) in key areas of the page – titles, header tags, main body content etc. With so much cross-over between PPC and SEO, analysing the two channels and adopting a blended approach to SEM can really make a difference to your overall search ROI. Unarguably, paid search is still one of the most effective methods for online marketers seeking to drive great results. Despite the buzz currently surrounding flashy new ideas such as social media, pay-per-click continues to remain a solid foundation for any serious advertising campaign, especially given its flexibility of set-up speed, measurement, tracking, optimisation and responsiveness. Real-time search is all the buzz but increasingly and the focus is on Twitter in this area. But increasingly, some of the most useful Twitter real-time search products aren’t on Twitter. 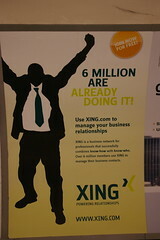 XING, a social network for professionals that counts more than 7m members, is a good example of that. Last week, it rolled out a real-time Twitter search app for its members called Twitter Buzz.